The legendary actress reveals some juicy behind-the-scenes tea on the hit OWN drama. Lynn Whitfield is trending on Twitter. Thanks to her role as Lady May on the hit OWN drama Greenleaf—whose first season comes to an end on August 31—Whitfield is enjoying a surge of popularity as the series has been renewed for season two. The Emmy-winning actress says she is honored to play Lady May, the first lady of a Memphis megachurch riddled in scandal. It’s a meaty and layered role on a well-received TV drama that dares to tackle problems afflicting black families and churches. Craig Wright (Six Feet Under) is a writer and executive producer on the show while OWN Network head Oprah Winfrey also executive produces and stars. It’s the type of fun that includes a highly anticipated showdown between Lady May and her wise but meddlesome sister Mavis (played by Winfrey) in the finale. 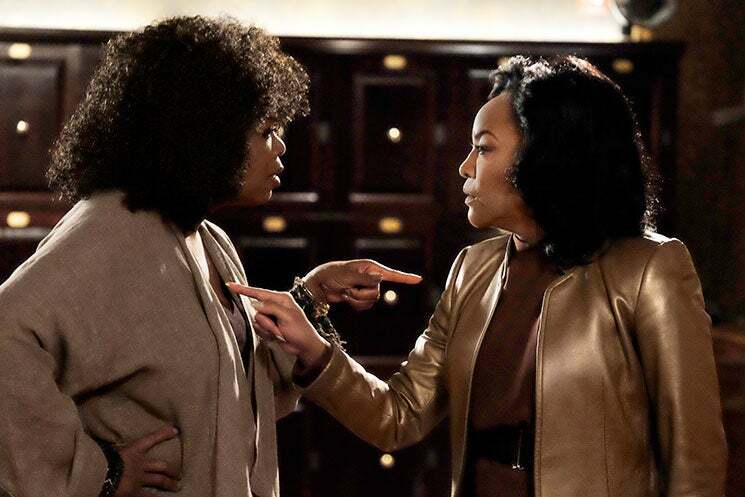 Winfrey has said the on-screen exchange grew so heated that Whitfield accidentally bruised her with a combative poke to the chest. But the scene didn’t start off that way, Whitfield says. Rest assured, Whitfield says, Mavis defends herself in kind. The season finale of Greenleaf airs Wednesday August 31 at 10 p.m. ET on OWN.